The close of August brought a couple of new surveys from Wisconsin, one from New York and a leftover from yesterday out of North Carolina. Also, FHQ should mention the IPSOS/Reuters state-level tracking polls floating around out there. Typically, the modus operandi here is take any poll and add it into the mix with the caveat that there is a preference for likely voter screens and multi-candidate results when available (when there are multiple versions of the results). But the IPSOS data is tricky on at least two fronts. First, the dates of aggregation within states are overlapping. In other words, they ostensibly share not only time but responses. There is an echo of one poll in another. Secondly, some of the sample sizes are incredibly small and thus have high margins of error. In looking back at the polls FHQ has added during March, there is no poll that has anything higher than a +/-5.0 MoE. There are a number of cases of this in the IPSOS data and many in states that are woefully underpolled. FHQ has some qualms with adding small sample size data anyway, but adding that sort of data in states where there is very little polling or no polling equates to adding data for the sake of adding data. Like Donald Trump on the immigration issue, FHQ will need some time to fully consider these issues and how/whether to include this data. Let this serve as an editorial note that the matter is being considered. The latest Emerson survey of the Empire state is more of the same. The story has been Clinton underperforming Obama and other past Democratic nominees in New York and Trump stuck in the low to mid-30s. That is true here as well. Clinton is running about ten points behind Obama's 2012 pace and the overall margin between Clinton and Trump about ten points behind the 2012 margin. The end result is still the same: a deeply blue state (and one not yet put in play by its favorite son). Emerson also surveyed North Carolina for the first time this cycle, and let's just say that that Marist survey from earlier this month is looking more and more like an outlier in a sea of narrow leads (or ties) for either candidate in the Tar Heel state. This one is the first survey to show Trump ahead since a small sample Survey USA poll on the heels of the Democratic convention. Still, North Carolina's is still a tale of a very close race; one favoring Clinton by a slight margin, but one that is inching closer. In the Badger state, two new surveys updated the early August picture (when last the state was polled). Together the Marquette and Monmouth polls show a tightening race and more clearly than elsewhere show an end to Clinton's convention bounce or the effects of Trump's bad post-convention week. Wisconsin has spent the summer hovering around the Strong/Lean Clinton line, but the addition of these surveys pulls Wisconsin's average down in to the heart of the Lean category. It is still an uphill climb for Trump at this point, but the trend line is moving in the Republican nominee's direction. As always, more data will be required to see whether or not this holds. There were not too many changes to the various figures after this last update for August. The map held steady, continuing to show a 347-191 Clinton advantage in the Electoral College. North Carolina and Iowa switched places on the Spectrum. Both are still very close but consistently tipped in the Clinton's direction. Wisconsin, as mentioned above, drew closer and thus moved down a couple of notches on the Spectrum in to the middle of the Lean category. The new polls there also moved Wisconsin off the Watch List, no longer threatening to jump into the Strong Clinton area. 3 New Hampshire and Pennsylvania are collectively the states where Clinton crosses the 270 electoral vote threshold to win the presidential election. That line is referred to as the victory line. 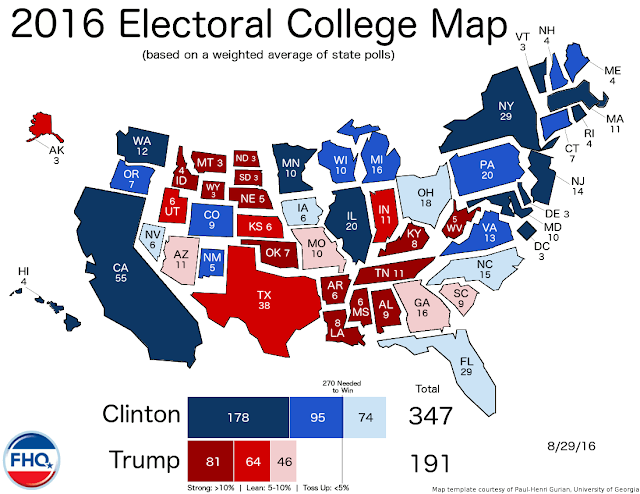 If those two states are separated with Clinton winning Pennsylvania and Trump, New Hampshire, then there would be a tie in the Electoral College. The national polls have begun to show a slight redirection over the course of the last week or so; an end to the Clinton bounce/Trump decline that defined the immediate aftermath of the convention period. That could be the start of a settling into the narrowing that Jim Campbell found marked the general election campaign. But that same sort of trend has not as clearly extended to the state level. It should be noted that that is not necessarily a function of a systematic difference across national and state-level polls. Instead, it is more attributable to the lack of a steady stream of state survey releases. With 70 days until election day, things have slowed to a trickle. Granted, things looked similar four years ago (one poll), but that was during convention season. And the flood of polling followed in September. A similar pattern of releases did not follow convention season in 2016. The pattern to look for -- or the marker perhaps -- is the calendar flipping to September. In any event, it is more difficult to detect whether the trend line in the national polls carries over to the state level. There just is not enough data on that yet. The evidence in yesterday's Emerson poll made it look as if Clinton was holding steady in her post-convention range and Trump was rebounding somewhat. That type of closing of the gap is not evident in Monmouth's first survey of the Keystone state. The eight point margin and the candidates' shares of support are consistent with the bulk of post-convention survey work there. This poll represents more of the same in Pennsylvania rather than a Trump resurgence/Clinton decline (or both). Compared to the last update there were no changes to the map or Spectrum. Only one poll being added will tend to have that effect. However, on yesterday, off today: on the weight of this poll Pennsylvania eases off the Watch List. Now, it is just outside of a point away from the Lean/Toss up line on the Clinton side of the partisan line. Monday's batch of polling brought on some level some interesting results, but from pollsters with spottier histories. Yes, there were new battleground surveys out of the Rust Belt (Michigan, Ohio and Pennsylvania), but it came from three landline-only samples from Emerson. In addition, there was a new poll released in Arizona from the pollster who has had one of the heavier Clinton leans of any firm in the Grand Canyon state thus far. The silver lining -- if one wants to look at it that way -- is that less representative though these pollsters may be, it did not disrupt the picture in the electoral college that has emerged here at FHQ. Looking overall at the 2016 polling in Arizona, OH Predictive Insights has now provided Clinton with three of the four leads she has had there. This latest survey is no different, though it shows a tighter race than the past polls from the firm have. The rest of the polling is close and in Trump's direction. The impact OH Predictive has had has been pretty minimal. Without them, Trump's advantage goes from just under a point to around two points. That series of polls has help Clinton, then, but not by much. Arizona is a toss up that favors Trump either with them or not. In the Great Lakes state, Emerson finds a closer race than most pollsters have recently. That is more a function of Trump's position in the survey: in this case around the ceiling for Trump in Michigan in 2016. Clinton is right in the range she has been in through the first eight months of the year. The question is whether this is a trend -- Trump gaining but not taking from Clinton -- or a matter of the methodological dependence on a landline-only sample. Emerson's snapshot of Ohio is also well within the established range for not only the candidates' shares of support but for the margin as well. Trump has a few more respondents in favor of him in the poll than Clinton, but the two are basically tied in the Buckeye state in this poll. It bears repeating that this is in the range of results lately witnessed in Ohio, but it breaks a string of post-convention leads for Clinton in the polls there. Like Michigan, this could be a narrowing in the polls like the contraction in the national polls. ...or, well, see the question in the Michigan section above. It is in Pennsylvania where the largest potential trend change can be found. The Emerson survey there bids farewell to the double digit or near double digit leads that have characterized polling in the Keystone state since convention season concluded. This one most resembles the PPP survey that was taken in the immediate aftermath of the Democratic convention. As with Michigan, the change has nothing to do with Clinton. She continues to hover in the mid- to upper 40s. Emerson finds Trump in the low 40s rather than in the mid- to upper 30s where the New York businessman has been in the majority of polls since the conventions. Across the board, then, the Emerson polls are the story of a Trump rebound if there was an apples to apples, Emerson poll to Emerson poll comparison. There is not. But it looks like in comparison to other pollsters' recent efforts in these midwestern states. We'll need more data to know whether these are trends or outliers. Compared to the last update there were no changes to the map, but Michigan flips spots with Oregon on the Spectrum and Arizona and Pennsylvania both drift within a point of switching categories to enter the Watch List. Arizona moves closer to the partisan line separating Clinton's and Trump's states and Pennsylvania tightens enough to by within a point of the Clinton Lean/Toss up line.